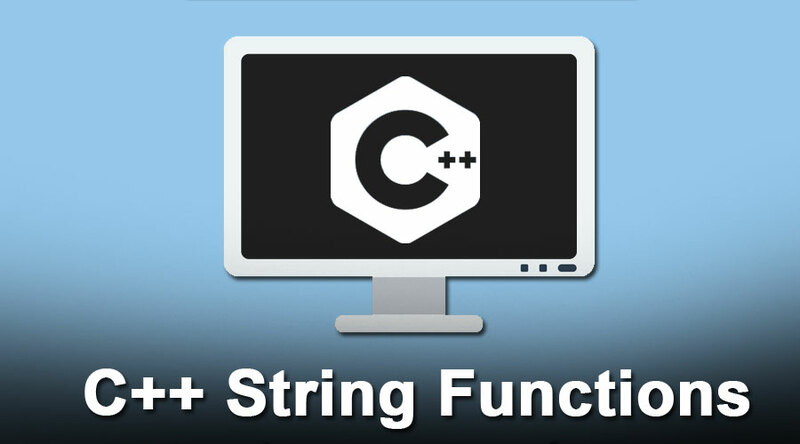 Today we are going to talk about C++ string functions. In any programming language string is core part to learn. All programming languages have nearly the same concept related to string. This feature gives us the ability to articulate our code. A string is a sequence of characters treated as a single object in c++. We have a string class in C++. This string class is used to initialize the objects, which holds a sequence of characters. To use string functions in C++ we need to add library named <string> in our code at the top, which gives you string functions. It must be included with the header file #include <string>. As we know there are many behaviors that string object understands and several operations we can perform on the string object. As we know cout<< is used to print on the screen in c++, and cin>> is to take input on the screen. Here our goal is to learn how can we play with the string. The standard string class in c++ overloads the assignment operator (=). To be more clear see Example #3. We have three objects str1, str2, str3. We concatenated two strings i.e str1 and str2 and the value are get copied into str3. that means assignment operator got overloaded and new value in our case is icecream got copied into str3. Strcmp(str1,str2): Returns -ve value if str1 is less than str2;0 if str1 is equal to str2; and >0 (+ve value) if str1 is greater than str2. Substr() : This function is very simple one. As the name suggests it. take the substring from the given string. This function takes two parameters. The first parameter suggests starting index no. The second parameter suggests how many characters you want from the starting index. string language = s.substr(0,3); // output of substr storing in language variable. Starting index is 0 and we need three characters from the 0th index so 3 is the second parameter. The second parameter works from 1 to n. not from 0 to n. so first three char gives us c++. Strcat(): This string function in C++ combines two different strings, As shown in Example #5. Strcmp(): As the name suggests this compares two strings and gives back the result. Suppose we have two strings str1 and str2. In other cases, it returns ASCII value of string depending on the character at that position. Strcpy(): unlike strcat, it will not append string into other . it will replace all the content. Strlen(): The simplest function in a row. This function defined in <cstring> header file. This function returns the length of the string. The length of a string is determined by the terminating null-character at the end \0. getline(): C++ string library functions also provide the getline function to read the whole line. It takes the first argument as a stream to read from. One of the most useful data types supplied in the C++ libraries is the string. For a better understanding of string, you must code while learning. We can’t get the actual concept without writing the code.